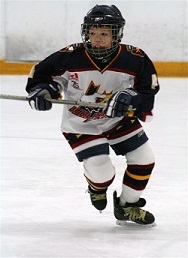 CanPowerSkate focuses on balance, power, agility, speed and endurance skills, all of which are especially important for hockey and ringette players. These session are designed for those children who can already skate forwards, backwards and stop. In these classes the skaters develop better balance, power, agility, speed and endurance, using edges, crossovers, lateral moves, pivot turns, and fast forward/backward starts. BSC Power Skating program is a technique based training program. The purpose is to teach players to skate faster not only without a puck but with a puck as well. The most important skill of any hockey player is the ability to skate efficiently and powerfully, our focus starts here. The ultimate goal is to have each player executing drills as quickly with the puck as without. We emphasize the mechanics of skating. REP - This Power skating program is geared to skaters who already have advanced skating skills and have played in the rep level this past year. For safety reasons participants should wear full hockey equipment that is CSA approved. The coach to skater ratio is 1:10. House League 6-8 yrs - This Power skating program is geared to skaters who already have some skating skills and have played in this past year. For safety reasons participants should wear full hockey equipment that is CSA approved. The coach to skater ratio is 1:10. Advanced House League 9-12 yrs - This Power skating program is geared to skaters who already have advanced skating skills and have played in this past year. For safety reasons participants should wear full hockey equipment that is CSA approved. The coach to skater ratio is 1:10.